How much does it cost to travel to Valencia? How much money will you need in Valencia? €76 ($85) is the average daily price for traveling in Valencia. The average price of food for one day is €27 ($30). The average price of a hotel for a couple is €67 ($75). Additional pricing is in the table below. These average travel prices have been collected from other travelers to help you plan your own travel budget. How much money do I need for Valencia? Valencia is a port city that sits on Spain's southeastern Orange Blossom coast, where the Turia River meets the Mediterranean Sea. As the nation's third-largest city, it is continually innovative in the arts and sciences with some futuristic architecture including a planetarium, oceanarium, and an interactive museum. The nightlife and daytime culture both thrive in their own ways, bustling with limitless opportunities for sight-seeing and entertainment. While the city is surrounded by fertile farmland, its center is a modern metropolis, skirted by beautiful beaches. 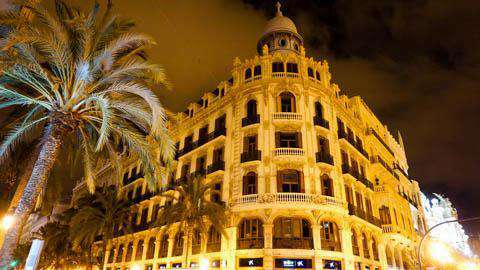 The city of Valencia is a mix of the old and new, placed in a setting where architectural innovations touch the sea. Perhaps one of the most interesting sights of the city is the old dried up river bed of the River Turia. Valencia diverted the flood-prone river to the outskirts of town and converted the former riverbed into a beautiful green ribbon of park winding right through the city. Today it includes soccer and rugby fields, an artificial boating lake, athletics track, playgrounds, fountains, and trails with bike paths that end at the City of Arts and Sciences. While this area is a hub for futuristic architecture and activity, the rest of the city is a blend of everything else. Modern buildings dot the streets amongst historic examples like The La Lonja de la Seda, a refurbished UNESCO landmark where the local silk trade took place. Stone buildings like this one with ornate moldings, gargoyles, Gothic archways, and renaissance flair exist as popular attractions throughout Valencia. Beyond parks and architecture, there are also the beaches. The entire district of Valencia is dotted with beaches all along its coastline; however, Valencia has its own city beach that sits about twenty minutes by bus or metro from the city center in the old town. Here is the place where sand meets the sea for a day of sunshine and turquoise waters. Valencia's old town, located at the city center, is one of the most popular areas of the city. In addition to being a wealth of history and architecture, it is also home to Valencias university and some of its most important museums. It is a center of activity during the day, bustling with visitors and locals alike, and comes to life at night with many bars and restaurants. Mercado Central, the citys old market and one of the oldest still running in Europe, offers a wide variety of food goods, fresh and mostly organic. From freshly baked breads and pastries, to fruits, vegetables, meats, cheeses, herbs, beers, and wines, the vendors at the market sell just about anything food-related you could ask for. Other neighborhoods of Valencia include the picturesque marina, the old river bed of the River Turia, coastal beaches, and the residential El Cabanyal. While the City of Arts and Sciences with its futuristic design is surely a sight to see, it is also a focus for activity where you will find a Science Museum, a planetarium, an IMAX cinema, an aquarium, and the Arts Museum. It is a highlight of the city in many ways, marking the end of the old riverbed parkan urban novelty in itself. The Mercado Central, of course, is another way of spending the day getting lost in the bustle of a local market, while the surrounding area offers a hub for shopping, dining, and sight-seeing of the old town center. As far as history goes, Valencia is home to many architectural gems like Torres de Quart and Torres de Serrano, and many interesting museums including the Lladro Porcelain Museum and Factory and the Valencian History Museum. If you only have a few days, check out this guide for more activities in Valencia. Outdoor activities in the city range from taking stroll through the riverbed park or relaxing on one of the coastline beaches. There is also a hot spring located about 90 kilometers north of Valencia, in a region known for its mountains, deep gorges, and scenic views of the surrounding nature. While the place is well-known to locals, it remains almost undiscovered by travelers. The clear waters of the lagoon bubble up at a temperature of 25 degrees (C) (77 F) year round. When it comes to food, the city of Valencia is famed as the founder of paella. Traditionally prepared in a large pan over a wood fire the base of the dish consists of Spanish rice, olive oil, saffron, and tomatoes. There are a myriad of variations, but the two most popular are Paella Valencia (with chicken) and Paella Marinera (with seafood). Tapas is another widespread method of dining, and perhaps the best way to taste your way around the city. It consists mainly of casual small plates to be accompanied by your drink of choice. Being located on the so-called Orange Blossom Coast, you cannot go wrong with freshly squeezed orange juice or a regional dish called Pato a la Naranja - duck with orange sauce. Another local delicacy is a cold and sweet, milky drink made from the horchata fruit. It is often served at breakfast and accompanied with fartons, another local delicacy of long finger-shaped glazed buns. Spanish omelettes (tortilla), spicy chorizo sausage, sangria, and gazpacho (chilled vegetable soup) are also popular items. Most eats can be found in the old town neighborhood surrounding Mercado Central, Valencia's central public market. Valencia Airport is located 8 km west of the city center. It has flight connections to about 15 European countries and is served by a large selection of airlines including British Airways, Iberia, Ryanair, Swiss International Air Lines, Transavia, and Vueling. The main train station, Estacion del Norte, is in the center of the city, near the Town Hall. RENFE is the national train company with tickets to Madrid, Barcelona, and many others. Buses come from almost every big city in Spain. The station is located by the river in Valencia, about 15 minutes walking from the center.